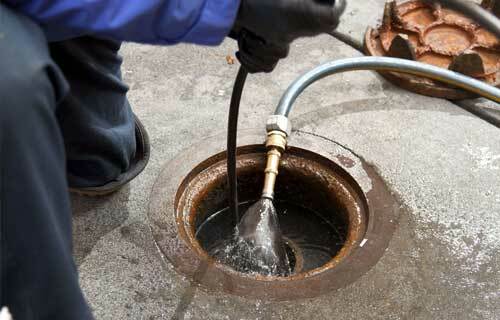 Canberra Blocked Drains Services clears blocked drains with our acid treatment service. A professional acid treatment can clear minor drain blockages caused by hair, soap or grease. Canberra Blocked Drains has a team of expert blocked drain specialists who have been trained to deal with many different types of blockages as well as many various drain cleaning techniques. Electric Eel Drain Cleaning is one of our expert drain cleaning techniques we offer to remove stubborn blockages in hard to reach places. We use a high-pressure hose system with a specially designed nozzle connected to a motorised unit that highly compresses the flow of water, producing an incredibly powerful water jet that is used to remove stubborn debris from your blocked drain. Using our innovative CCTV camera technology, our specialist technicians can inspect your pipe networks. This is incredibly useful in finding the cause of an obstruction, the location of the blockage and examining the structural integrity of your drains. Using CCTV cameras is the most economical way to service and repair pipes as we can accurately assess the condition of your drains and provide the most efficient solution to unblocking or fixing your drains. Sewer and stormwater drain blockages can often end in significant destruction to your home with substantial costs to repair if you do not attend to these matters as soon as you notice them. Canberra Blocked Drains Services can accurately assess your sewer and stormwater drains to determine the cause of the problem which allows us to provide an efficient service to unblocking and repairing these issues. 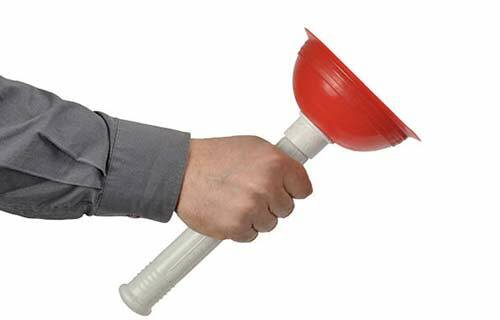 Canberra Blocked drains can clear blocked toilets, sinks and drains with the plunger technique. 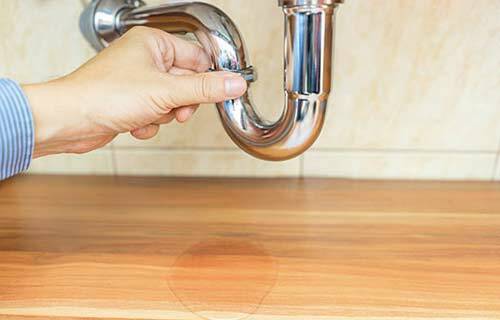 Common drain blockages occur in our sinks and toilets; these obstructions are inconvenient as they can stop the regular functioning of your home. You need these problems fixed fast but you don’t have the right tools to fix them yourself, or you don’t have the time to fix these issues. Using our high-pressure hose system, we send a blast of high-pressure water through the drains, removing hard debris and even tree roots from pipes. Hydro jet drain cleaning allows us to reach parts of pipe networks which are usually near impossible to achieve without excavation. Hydro Jet Drain Cleaning is a fast and economical solution to clearing severely blocked drains. 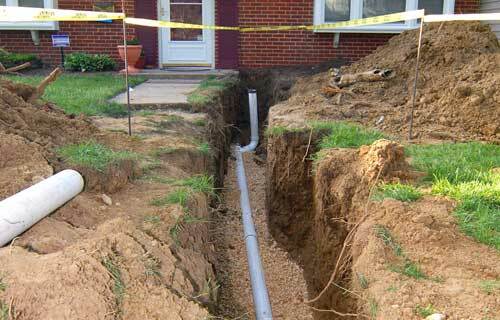 Canberra Blocked Drains pipe relining service is an excellent solution to damaged pipes and drains. Pipe relining provides a reliable and economical solution to the issue of cracked and damaged pipes. 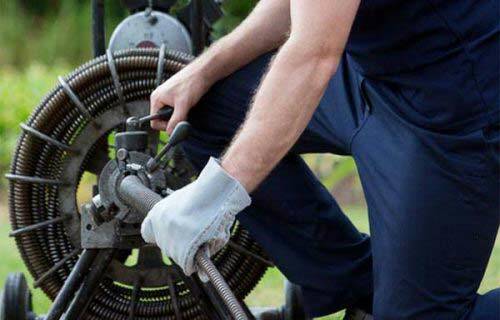 The team here at Canberra Blocked Drains Services has specialised equipment and the expertise to renew and re-line damaged areas and even full pipelines, saving you considerable time, disruption, and money. 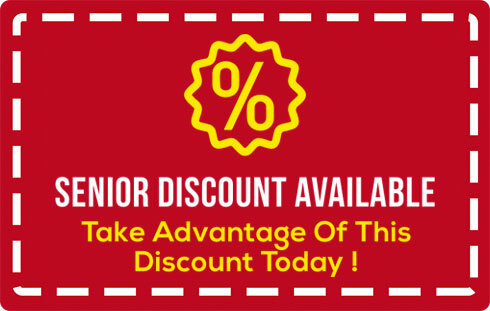 Take advantage of our limited time specials and offers below. 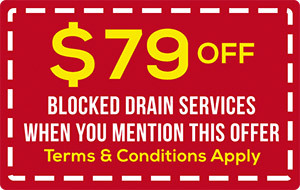 This is your chance to receive a quality service from Canberra Blocked Drains Services for an exclusive price! To use any of the offers below, call our team on 0477 444 630. 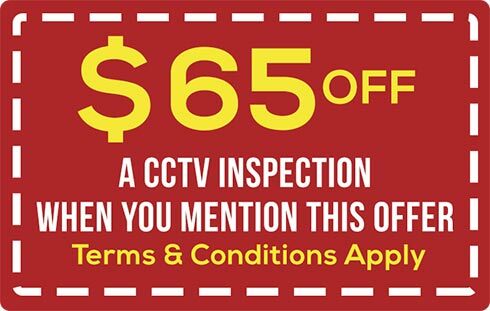 Terms and Conditions apply to all coupons. Contact us for more info. 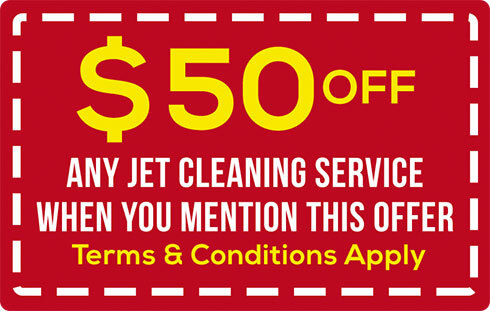 Simply Mention this Promo/Coupon + Promo Code above when you speak with a customer care team member. Our team of Blocked Drain Specialists are fully licensed and are entirely capable of clearing blocked drains. 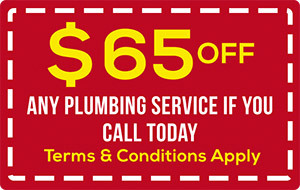 Every service completed by Canberra Blocked Drains Services comes with a lifetime warranty. 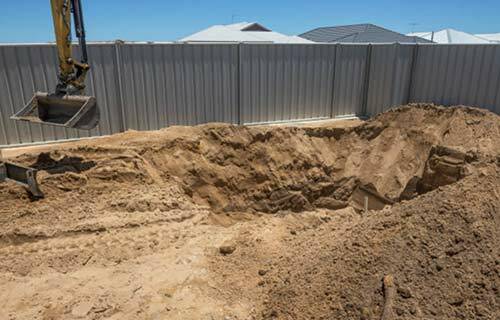 For all your drainage plumbing needs in Canberra, you can count on Canberra Blocked Drains Services to have the job done fast. We provide a rapidly responsive service along with our quality workmanship. I contacted Canberra Blocked Drains Services with a severe problem with tree roots in growing into our sewer. They came next morning as requested, and even rang me when they were on their way. The very high-pressure water jet was successfully used by Aaron to cut through an extensive root mass. He even used a drain camera to check that the drains were clear after he had finished. After using previous plumbers to try and solve our blocked drain issue, I am glad I found Canberra Blocked drains Services who cleared up the problem first go. The price charged was fair and competitive and the team was always friendly. I would recommend Canberra Blocked Drains Services strongly to anyone who has issues with blocked drains. My regular plumber for many years suggested Canberra Blocked Drains Services when he encountered repeated stubborn blockage problems, both indoor and outdoor. I was overwhelmed with the friendly and efficient service I received from Canberra Blocked Drains Services; the customer care team and the technician were accommodating and professional and did fantastic jobs. Shane unblocked the pipes, Andy and Liam relined them. It gave me the peace of mind that we have a permanent solution to our drainage issues. 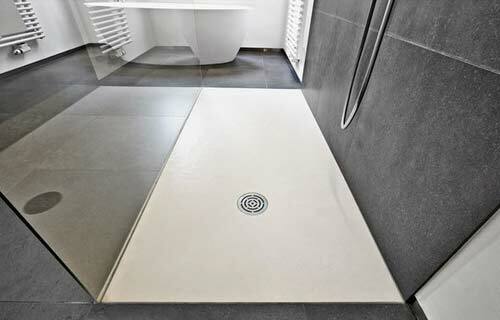 Canberra Blocked Drains Services are Canberra's drainage specialists. We had a great experience when we used Canberra Blocked Drains Services recently. We've had a recurring drain blockage problem due mainly to tree roots. Andy, the technician, was incredibly efficient, friendly and informative. He was able to identify the problem quickly and had all the equipment needed to rectify the problem on the day. He was accommodating and answered all questions and ensured I understood the situation. He Even gave a permanent solution to the problem, in case it should happen again. If we had used Canberra Blocked Drains Services years ago, we probably would have saved a lot of time and money on rectifying this issue. I was delighted with the service we received, and would not hesitate to recommend Canberra Blocked Drains Services to others.